Why don’t you talk about Timo Werner? Timo Werner’s KPIs clearly indicate him as one of the most gifted young forwards in Europe, but the non-German media have not given him much attention, yet. 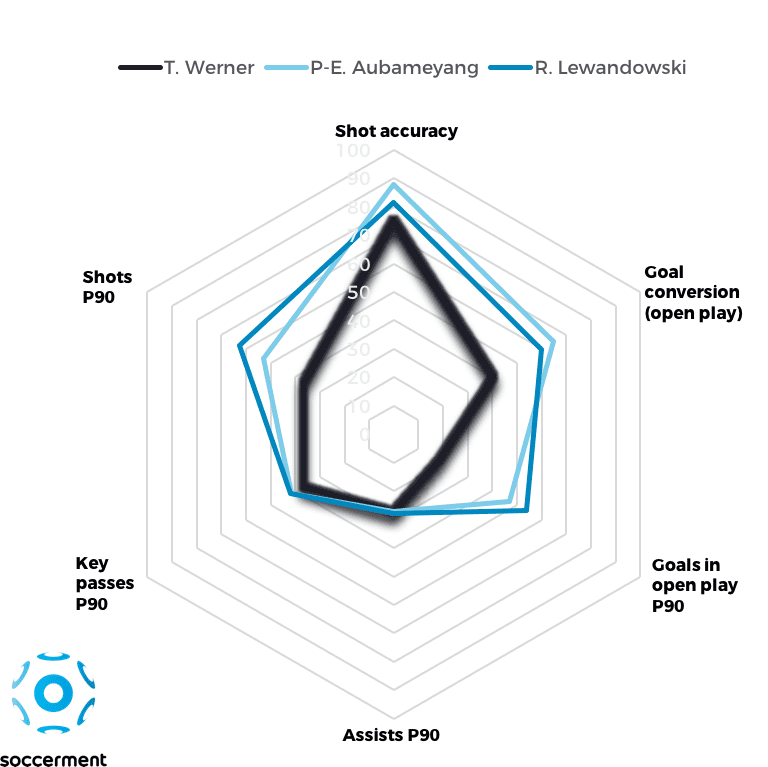 We analyse his recent developments (shot accuracy, goal conversion and shots per game, inter alia) and compare them to the trajectories of Aubameyang and Lewandowski since they were 21. We come to the conclusion that Timo Werner has great potential and time on his side to reach them. 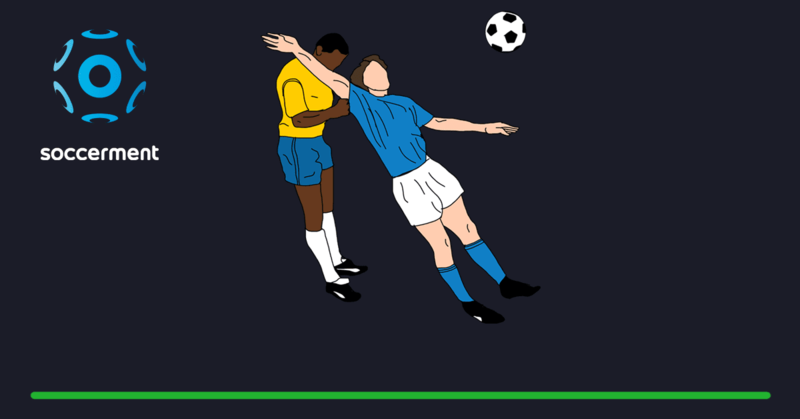 After the top scorer previews of Italy, England and Spain, it is time to move our attention onto the German Bundesliga. 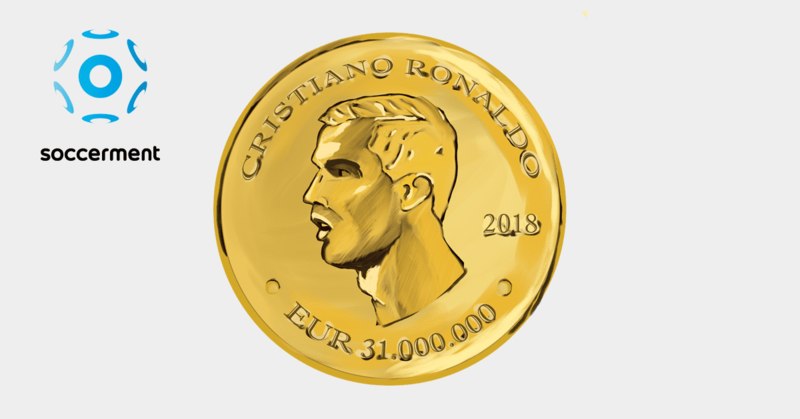 In the past five years, the German “Meisterschale” has been easily won by Bayern Munich, but the Bundesliga’s top scorer title went to a Bayern-player only once (Robert Lewandowski in 2015/2016). 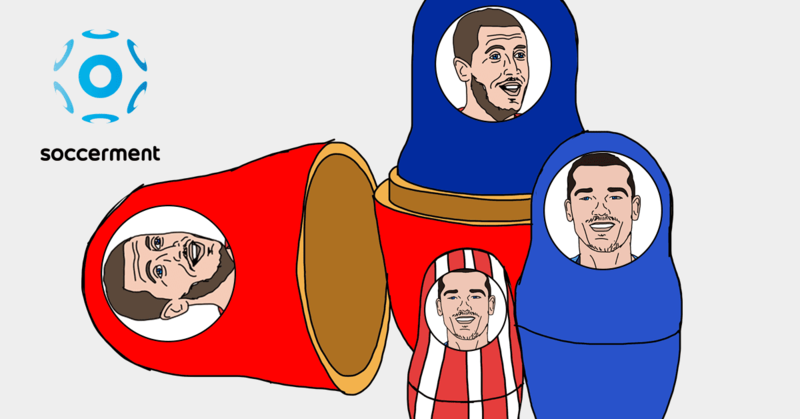 On top scorers (see the full list), the Bundesliga is often ready to surprise, sometimes with “one-season-wonders”, but often unveiling new faces and/or previously underrated players. The Borussia-Bayern dualism over the last few years has caught all the headlines, highlighting the talent of two great players like Lewandowski and Aubameyang, but shadowing, in our opinion, one of the most gifted forwards in Europe: Timo Werner. Before diving into numbers and graphs, it’s important to point out what Werner has already accomplished at the young age of 21. After RB Leipzig bought him for a €10 million record fee from VfB Stuttgart at the beginning of the 2016/2017 season, the German striker became the youngest player to play 100 matches in Bundesliga, at the age of 20. 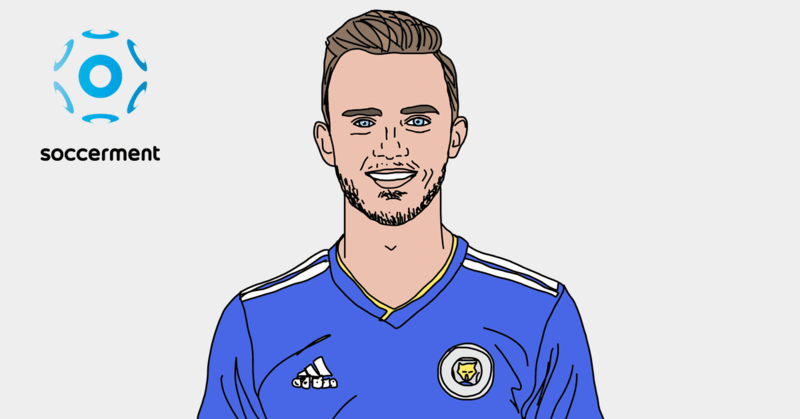 At the end of the 2016/17 season, with 21 goals (of which 2 penalties) he was the top German-national goalscorer in the division, helping the newly promoted RB Leipzig to qualify for the UEFA Champions League (‘UCL’), for the first time in the club’s history. A few pundits would have probably expected to see Leipzig bagging the UCL qualification, right after the promotion. At the same time, a very few would have probably bet on Timo Werner to score more than 20 goals. However, that is exactly what happened last year. As we can see from Chart 1, over the past four years, Werner’s KPIs have constantly improved, with the new highs in the last season. The total number of shots per 90 mins moved from 1.66 in 2014/15 to 3.15 in the current season. His number of shots from inside the penalty area more than doubled from 2014/15, moving from 1.2 to 2.3 in 2016/17 and to 2.6 P90 so far in 2017/18. 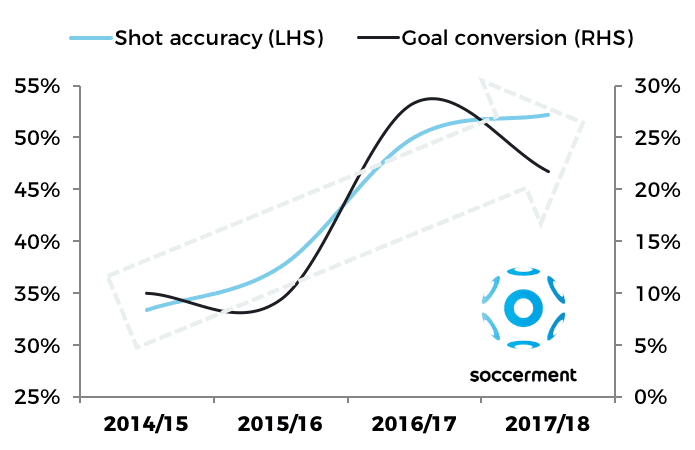 As shown in Chart 2, his level of shot-accuracy and, consequently, his goal conversion rate have improved dramatically over the past four years. 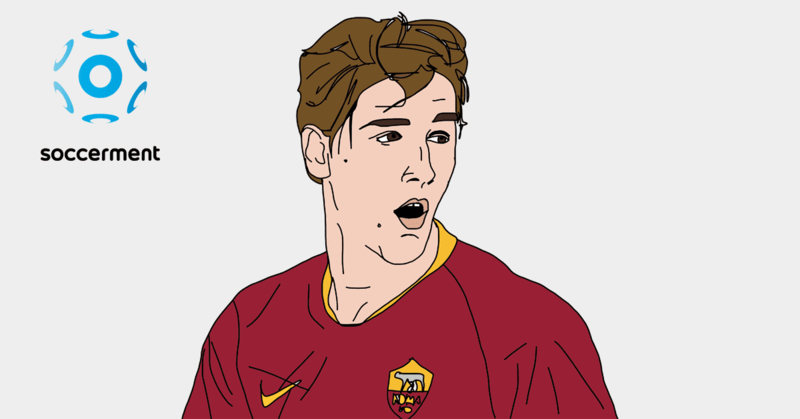 Moreover, beside his strong ‘central-forward’ stats, Timo Werner has shown throughout the past season a great ability to adapt to the tactics of coach Ralph Hasenhüttl. In fact, Timo Werner does not seem the kind of central forward only committed to receive ball at the centre of the penalty area. He spreads his zone of influence all around the pitch. In particular, around the left wide area, from where he receives the ball and carries it while cutting-in the pitch in the final third with his right foot. Once he receives the ball, Werner knows how to deal with it, beyond shooting: he collected 5 assists in 2016/17 (1.2 key passes every 90 mins). To give an even higher relevance to these numbers, when we compare him to Lewandowski (6 Assists and 1.03 key passes P90) and Aubameyang (3 Assist and 0.93 key passes P90), we can see how complete the German striker is. And remember: he’s only 21! So far this season Timo Werner has scored 5 goals in the Bundesliga. 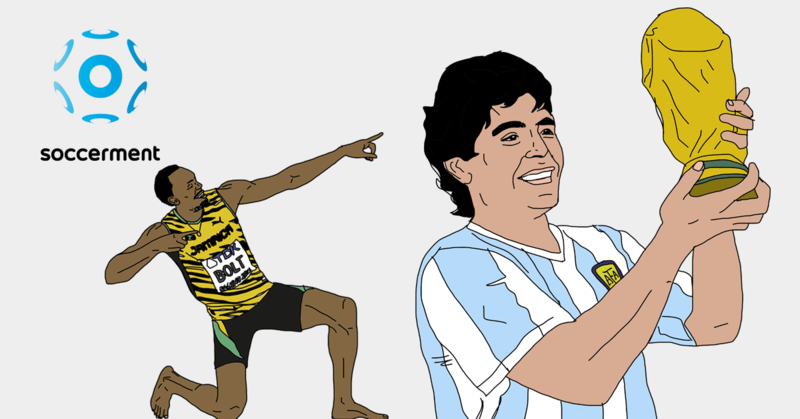 He is third in the ranking, which is currently dominated by Aubameyang and Lewandowski, who have both scored 8 times. Understandably, as our radar chart well describes, Timo Werner is still not as “influential” as the two more famous colleagues. But again, it is important to state the age difference between the three. 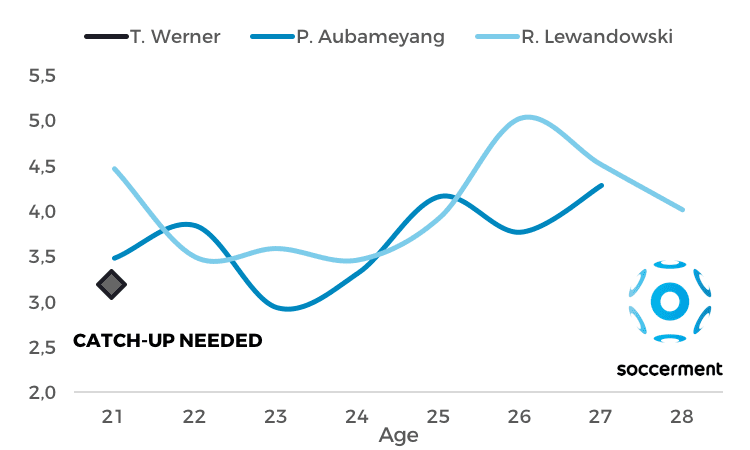 Lewandowski and Aubameyang are respectively 29 and 28 and so they are in their peak-age, while Werner is only 21 and still in his improving phase. 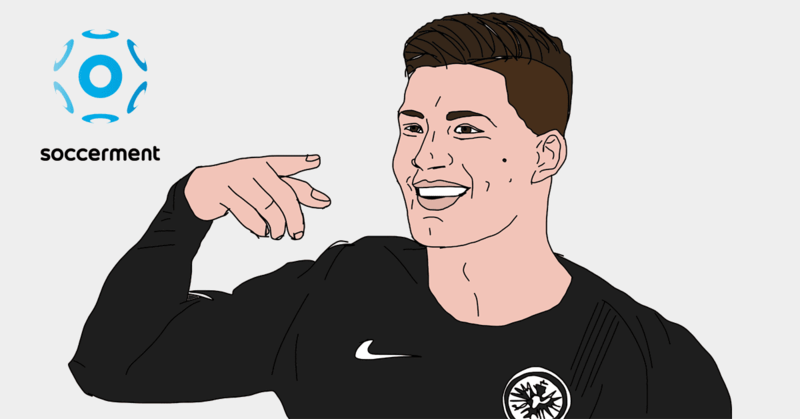 In our opinion, Werner has all the skills to inherit their legacy, but he will need to keep improving. 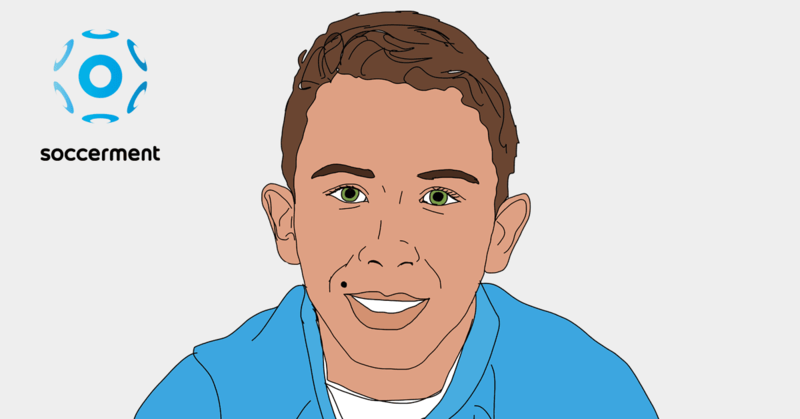 The first area of focus should be the number of shots P90. In our database, a standard attacking player of the top 5 European leagues shots on average at 2.97 P90. In the 2016/17 season, Werner took 2.44 shots per 90 mins, while Lewandowski and Aubameyang finished the season with 4.19 e 3.55 shots every 90 mins, respectively. So far in 2017/18 he has reached 3.15 P90, still 19% lower compared to average of Lewandowski and Aubameyang. To be fair, we need to make one consideration beyond the young age (thus, the room for improvement). Werner has a different positioning on the pitch, compared to Lewandowski and Aubameyang, who are typical “number 9”. He normally receives the ball farther from the goal and creates chances for his teammates (as aforementioned, he delivers more key passes). More than a “false nine” like Messi, we see him as a “9 and a half“. To understand what scoring level Timo Werner could aspire to, we looked at how the performance indicators of Lewandowski and Aubameyang have developed over the years, since they were 21 year-old. 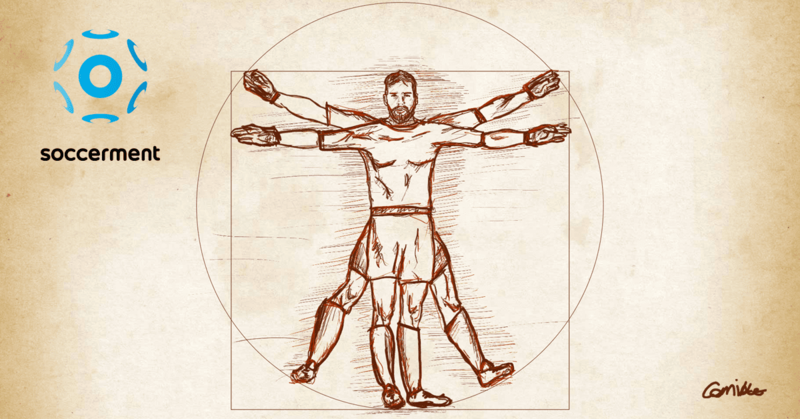 In Chart 3, we display the number of shots taken every 90 minutes. Werner is currently not far from where Aubameyang used to be at his same age (2011/12 season), when he played for Saint-Etienne and scored 16 goals in FL1. 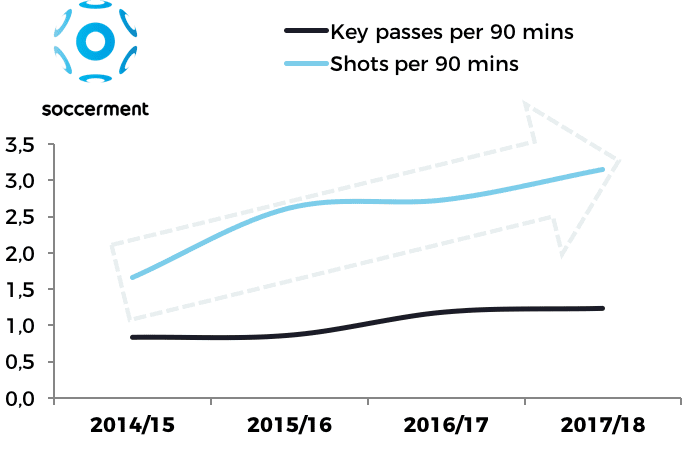 Since then, Aubameyang’s shots P90 have increased with a CAGR of 3.5% (CAGR: compound annual growth rate). Starting from a lower number, in order to fully-catch-up with Aubameyang, Werner would need to improve at an yearly rate of 5.2%. This year, Werner’s shots P90 are up 15% year-on-year. Chart 4 is really encouraging, for Werner’s and RB Leipzig’s fans. The goal conversion rates of both Lewandowski and Aubameyang have more than doubled over the years. The interesting thing is that Werner is well beyond the level that the two players displayed when they were 21. Werner’s ongoing goal conversion rate this season is 21.7% vs. 10.0% for Lewandowski (2010/11) and 13.1% for Aubameyang (2011/12). Furthermore, the high goal-conversion rate comes from a better shot accuracy: 52.2% vs 36.3% for Lewandowski (2010/11) and 39.3% for Aubameyang. 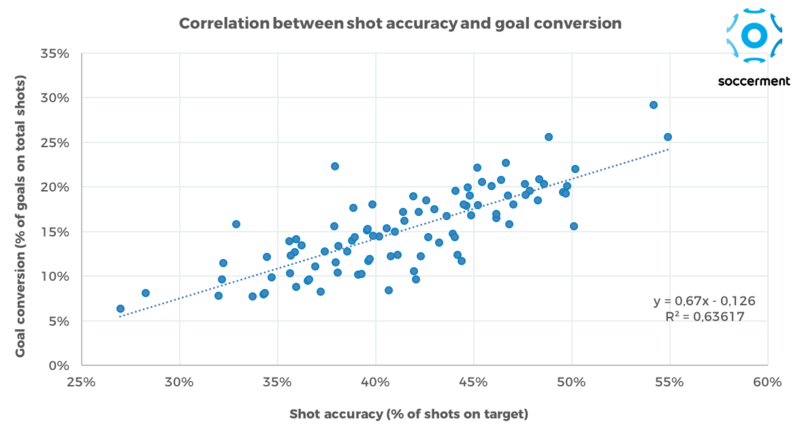 It needs to be noted (see the chart below), that the aforementioned goal conversion rates are consistent with the respective shot accuracy levels, as described by our regression equation (goal conversion = [shot accuracy x 0.67] – 0.126). 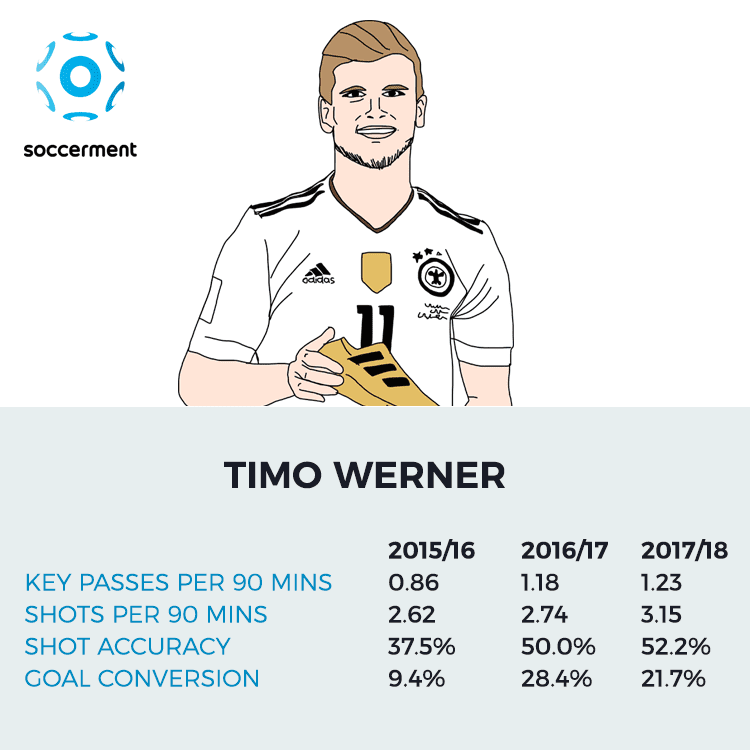 The data show quite promising developments for Timo Werner. Whilst his current stats are not at the same level of Lewandowski’s and Aubameyang’s, Werner has a lot of room for improvement, as he is only 21 year-old. In a few years, we will discover what kind of player he decided to become. For the time being, we recommend you to wait and enjoy a rare species of number 9; the (still) not-well-known Timo Werner.